4 All-Ireland Senior Hurling Medals – 1949, ’50, ’51, ‘58. (Non-Playing Sub in the 1945 panel). 4 Munster Senior Hurling Medals – 1949, ’50, ’51, ’58. 8 National League Medals – 1949, ’50, ’52, ’54, ’55, ’57, ’59, ’60. 2 Oireachtas Medals – 1945, ’49. 14 County Senior Hurling Medals – 1944, ’45, ’46, ’52, ’55 (Capt. ), ’56 (Capt. ), ’57, ’58, ’59, ’61, ’62, ’63, ’64, ’65. 16 Mid Tipp Senior Medals 1942, ’44, ’45, ’46, ’50, ’52, ’55, ’56, ’57, ’58, ’59, ’60, ’61, ’62, ’63, ’64. Right-Full-Back on Tipperary Team of the Millenium – 1999. Mickey Byrne, known to one and all as “the Rattler” held down the right-full-back position for Tipperary for 12 championship seasons between 1949 and 1960. He had served an apprenticeship before his debut season of ’49 though, and was a substitute on the All-Ireland winning team of 1945. It all began for Mickey in the sense of formal hurling when he attended Thurles CBS, winning a Dean Ryan cup medal with the school in 1939. He graduated to the Tipp minors playing in the losing 1941 final against Cork. In 1944 Mickey won his first county senior medal in what was to prove a spectacularly successful career with Sarsfields. By this stage Mickey was knocking on the door of the Tipperary team and as mentioned earlier, was a substitute on the successful 1945 panel which was led by his club-mate John Maher, and which altogether included a remarkable 12 Thurles men. The following three years were lean years for Tipp as Cork regained the ascendancy in Munster, though it was Limerick who were to prove Tipp’s masters in those years, and when there was a major shake up in personnel in 1949 after three disappointing years, Mickey’s time had come. By the time Tipp won the All-Ireland title in 1949, only three of the 1948 team had survived to share in the glory, and the new team was backboned by the likes of Mickey Byrne and some of the star minors of the ‘45-’47 era such as John Doyle, Pat Stakelum, and Phil Shanahan. This team had some huge battles with Cork over the next six years, and it was an atmosphere in which Micky Byrne, with his fiery, indestructible style which belied his ten and a half stone frame, revelled in the uncompromising exchanges that were an integral part of this era. 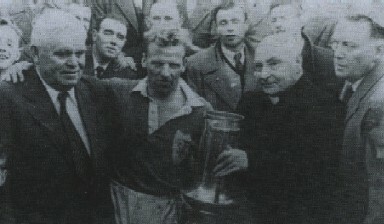 Mickey receives the Dan Breen Cup on behalf of Thurles Sarsfields in 1955. The priest is the county chairman Fr.Meagher, on whose left is Phil Purcell of Moycarkey, the county secretary. On Mickey Byrne’s right is the legendary freedom fighter Dan Breen. Mickey was part of a great full-back-line – surely Tipp’s greatest – along with Tony Brennan and John Doyle, with the peerless Tony Reddan behind them. Right through the 1950s, after the retirements of Brennan, and Reddan, Mickey Byrne remained a constant presence in the number 2 jersey for Tipp, with the exception of the 1954 season when he played at right-half-back, but he had to wait until 1958 for his 4th All-Ireland medal. In the intervening years though, he had two of his career highlights when he captained his club to Dan Breen cup success in both 1955 and ’56. This was the start of Sarsfields great run which gave them 10 county titles in 11 years, and meant that Mickey picked up a record 14th county senior medal in 1965 at the ripe old age of 42. This is a record that will surely stand the test of time. Surprisingly one medal missing from Mickey’s collection is a Railway Cup memento, although he did play in a losing final. It defies logic that a player who was a regular in a county which was the there or thereabouts as the best in the country throughout his long career did not find favour more often with the provincial selectors. Mickey also picked up 8 National League Medals along the way, which makes him one of the leading medal winners in this competition, and indeed it was with a League victory – over Cork at the Cork Athletic Grounds in 1960 – that he bade farwell to inter-county hurling after a long and illustrious career. Mickey – notoriously one of the wittiest characters in Tipperary GAA - and his defensive colleagues the late Tony Brennan, and John Doyle were to be chosen together in one more full-back-line; that of the Tipperary Millenium team, and considering that half a century had passed since they were in their prime, it speaks volumes for the reputations that they have achieved.